I dearly love visitors! I mean, what’s not to love? They came to see me! Well, Maxx & Annetta drove here all the way from Darlington, Maryland just to meet the diva. And I was more than happy to grant them an audience. I even played for them. 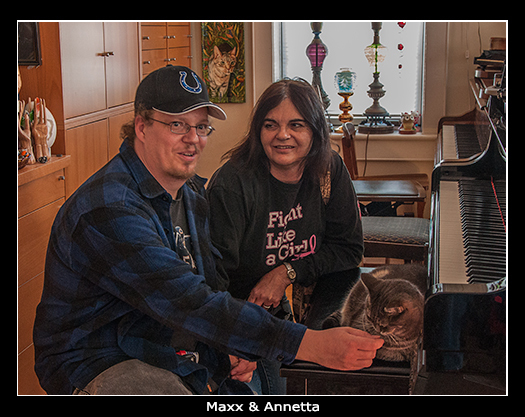 Of course they were so pleased and they took pictures and Maxx even sat with me briefly on the piano bench. Normally, I don’t allow that kind of familiarity, but there was something about him that seemed kind and genuine, especially when he intimated that four other cats had consented to take him in. That says a lot about a human’s character, don’t you think? Thanks for having us over, Nora! So cool to meet a celebrity of your caliber. We had a great time! Can’t wait to tell everybody that we got to hear you play!